"...the solutions to our challenges around child poverty, youth employment and housing—The Salvation Amy considers it’s naïve to believe and dishonest to suggest that these solutions do not require more tax dollars. The source of these extra tax dollars is, of course, a problem particularly considering the global economic situation. In our view the need for a society that is just and gives every citizen the right to participate economically and socially is so important, that ways must be found to find this additional tax revenue." As Michael Laws commented yesterday, when did the Sallies become communist? And in the related matter of a living wage, at last Bill English is pointing out that many people have their minimum wage topped up with various forms of government assistance. Here's the problem for the living wage campaigners. If a worker receives a higher wage, he will lose his means-tested government assistance. He'll quite probably be no better off. I'm quite happy for the employer to pay more so the tax payer pays less. It's is the employer that benefits from the labour purchased. But the bottom line is, the worker is no better off. And isn't improving worker well-being and prosperity the whole aim of this campaign? There are people who cycle between benefit and prison. It's highly likely that there's significant overlap between the numbers below. I've just got the data for 2011. There's a trend there. Interesting. Under a Labour government more people were granted a benefit on release than had a benefit stopped on incarceration. Under a National government, that has reversed. What can be said for certain is that more people on benefits are going to prison. Of course, it's still only a tiny fraction of the beneficiary population. But it's quite a large fraction of the prison population. "The profile of the prison population also provides challenges. Maori continue to be over-represented in our prisons, reflecting the high proportion of Maori population in the crime-prone age range." The highest crime-prone age group is 20-24. 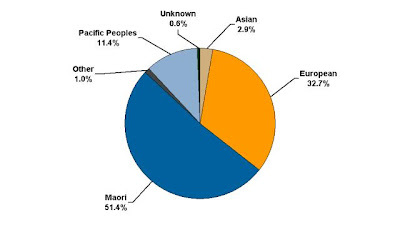 8 percent of the total male Maori population is 20-24. 7 percent of the total male non-Maori population is 20-24. Of the crime-prone 20-24 year-old age group Maori represent only 17 percent. "The total number of Maoris convicted and sentenced in the Supreme Court during the last five years is only 216, indicating that serious crime amongst the Native race is far from prevalent."